The BEST Pecan Pie Bars! These delicious bars are dairy-free and perfect as a wholesome fall dessert recipe. So yummy! Can we just take a moment to do a happy dance and appreciate the wonderfulness that is fall and pie season? All the cozy things. I’m all about them. But especially baking warm, delicious pies that make your house smell amazing! This year, we’re kicking things off with the BEST ever Pecan Pie Bars that are not only incredibly delicious, but also vegetarian and dairy-free. Wholesome and lightened up, but also not “too healthy” 😉 Ya know? Basically the most perfect for a sweet fall treat! You can follow this recipe and make the pecan pie bars to serve right away! However, if you have company coming over the next day or maybe want to save some of the filling/crust for another day, the ingredients can be made in advance and frozen! The day you’re ready to serve these pecan pie bars, simply defrost the ingredients and put them together, then bake. So easy and yummy! Can you freeze pecan pie filling? Yes! Simply mix the ingredients for the pecan pie filling together. Make sure to use a good, airtight container or vacuum sealer to freeze the pecan pie filling! For this recipe, I actually made the dough and filling separately and then froze them for later using the Newell FoodSaver®! 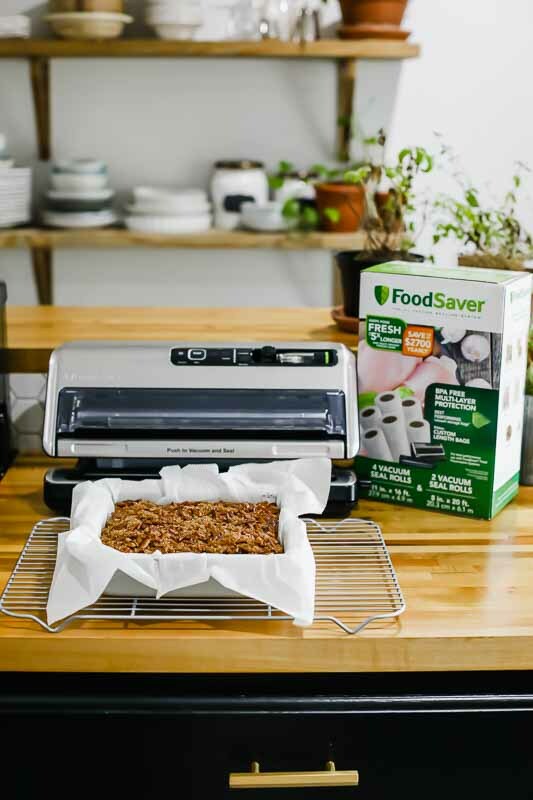 Specifically, I used the FoodSaver® FM5330 Vacuum Sealing System and FoodSaver® 6-pk. Heat-Seal Rolls (can be purchased at Kohl’s). 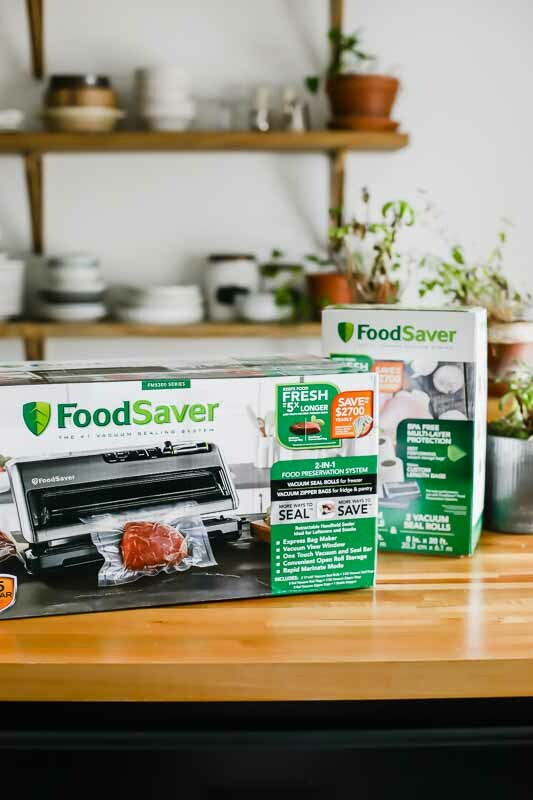 The FoodSaver® does exactly what the name says it does: saves food and keeps it fresh for up to 5x longer than ordinary storage methods! It also helps to save time whenever you’re baking for company. 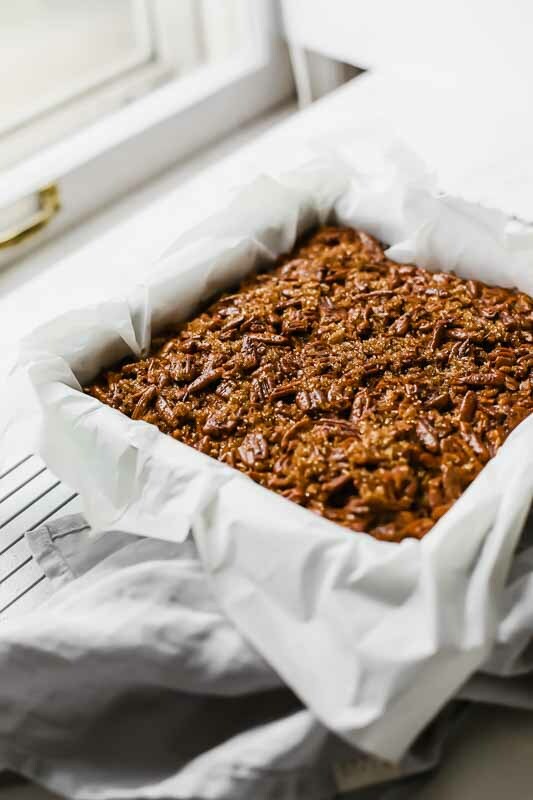 Perfect for batch cooking and meal prepping things like these delicious pecan pie bars! 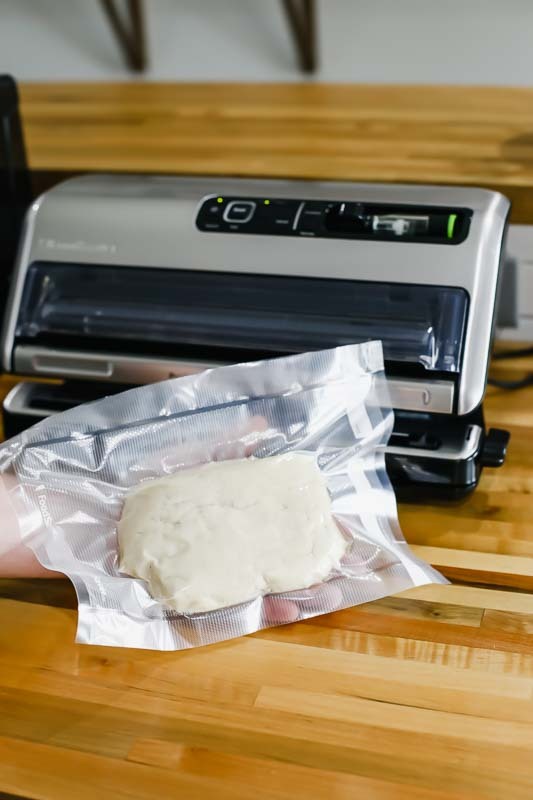 The system comes with vacuum seal bags and rolls, vacuum zipper bags and containers designed to work together with vacuum sealers for the best performance. The bags are BPA-free and flexible enough to seal food without gaps. 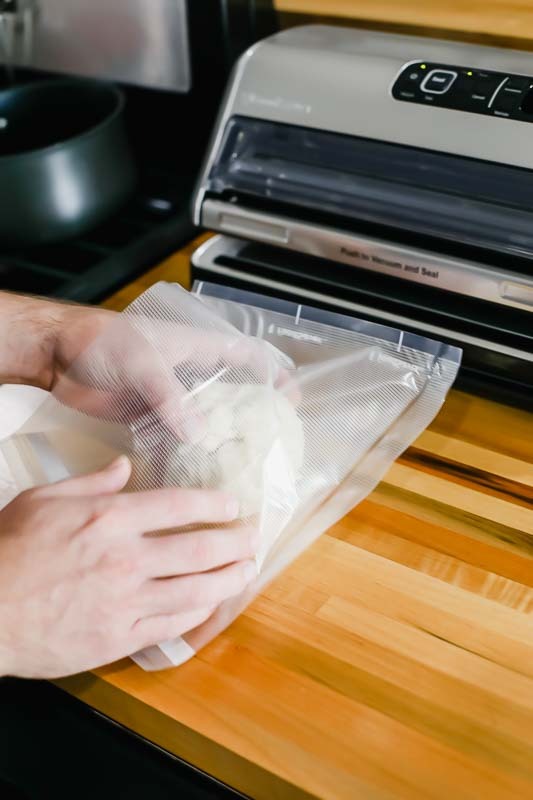 Simply place the dough (or pecan pie filling) in the bag, place the edge of the bag in the sealer, and let it do it’s thing. 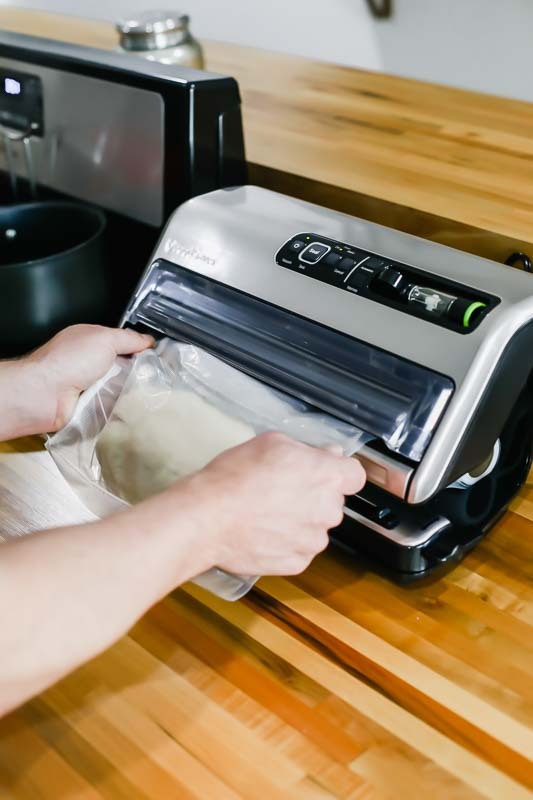 I’m really loving using the FoodSaver® for easy and effective vacuum sealing! 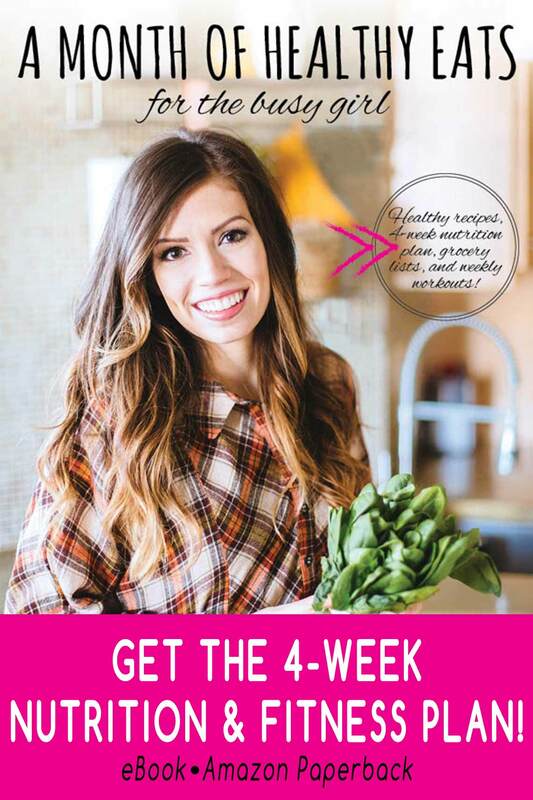 P.S: be sure to enter the FoodSaver® Sweepstake HERE! 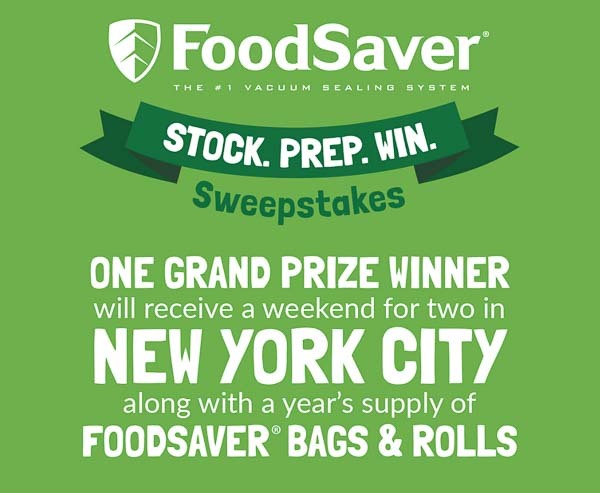 This holiday season, every purchase of FoodSaver® bags and rolls gets you closer to a trip to NYC! 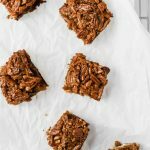 These pecan pie bars are truly the BEST! They’re SOOOOOOOOOO times a million good! I honestly couldn’t even tell that they’re healthy/wholesome the first time that I tried them. They’re like the best pecan pie ever, in bar form. Seriously, no joke. Go ahead, try them! Create 1/2 of the Mini Apple Pies crust recipe. Roll the dough flat, then place in a 9x13" pan (allowing the crust to come up the sides about 1-2 inches). Combine everything for the filling except for the pecans. Once the filling is mixed evenly, add in the crushed pecans. Pour the filling into the crust, then top with the pecan halves. Bake for about 30 minutes, then let cool slowly. 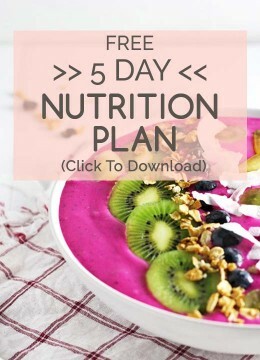 *This recipe can be easily made vegan by replacing the egg with a vegan egg! These bars look so delicious! Love the nuts on top and your photography is simply fab!